The New York Times on Monday marked the 50th anniversary of the death of Fidel Castro henchman and murderous Communist thug Che Guevara. The paper’s Andes bureau chief Nicholas Casey filed “Execution Haunts Village 50 Years After Guevara’s Death.” The left has long been infatuated with the Communist killer, and will read nothing to change their minds in the Times' blandishment remembrance from Bolivia, marking Guevara’s execution. The only unforgivable sin in this culture are being conservative. Everything else is so easily forgiven and forgotten by the media. Kathy Griffin made it to the cover of The Guardian this week, dressed as Che Guevara, the infamous Marxist revolutionary who helped bring communism to Cuba and murdered a whole lot of people while doing it. The public most likely knows her best as the woman who channeled ISIS and held up a severed bleeding fake head that looked like Trump for a photoshoot. But in the interview, Griffin maintained that she had done nothing wrong. Netflix’s newly released comedy series One Day at a Time bears little resemblance to the original show that aired from 1975 to 1984. Leftist Executive Producer Norman Lear created both shows but the only similarity is the show name – and the wedging in of some liberal issues. How ironic it is that the announced death of Cuban Communist dictator Fidel Castro late Friday night coincides with the U.S. establishment press's obsession with smearing websites which dare to challenge their narratives as Russian-inspired "fake news." Castro's original rise to power was arguably the product of a spectacularly fake dispatch written nearly six decades ago by reporter Herbert L. Matthews and published in the New York Times. On Monday night amidst the voluminous amount of Cuba coverage, ABC’s World News Tonight and NBC Nightly News made sure to not inform their viewers of an ominous and disturbing backdrop hours earlier when President Obama and a portion of the U.S. delegation stood in Havana’s Revolution Square with a mural of the brutal leftist leader Che Cuevara in the background. Jennifer Latson paid tribute to communist thug Che Guevara on the anniversary of his death in a gushing Friday item on Time magazine's website. Latson marveled how the Argentinian radical "might have considered the United States his worst enemy, but he faced an even greater threat to his revolutionary ambitions: asthma." The writer later touted that "asthma didn't keep him from embracing the rowdiness of youth," and that "it didn't prevent him from following a rugged revolutionary road to Cuba." CBS's Bigad Shaban filed a puff piece about the "Occupy Wall Street" demonstrators on Tuesday's Early Show, trumpeting their "self-operating mini-community in lower Manhattan" and how they were "hungry for change," all the while ignoring the radical left wing politics of many in attendance. Shaban took more time to note that "this isn't your average protest. Yoga classes are taught in the off-time." Cavuto Corners Dem Congressman Supporting Wall Street Protesters: Why Didn't You Back The Tea Party? A number of Democratic members of Congress came out Wednesday throwing their support behind the protest known as Occupy Wall Street. Communist Cuba's Castro brothers may be asking themselves why they need to engage in any propaganda on their own when they have Associated Press's Images Division promoting photos of Dear Leader Fidel Castro as "iconic" and the brutal Ché Guevera as a "revolutionary hero." 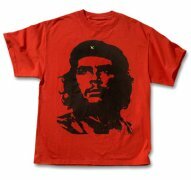 Monday’s New York Times obituary by Victoria Burnett celebrated the traveling companion of the guerilla leader and Communist murderer turned t-shirt icon Che Guevara in “Alberto Granado, 88, Friend of Che, Dies," and skipped over the facts about Guevara's violent life as a left-wing "revolutionary." Alberto Granado Jiménez, the Argentine biochemist who accompanied the young Che Guevara on his formative odyssey across South America, died here on Saturday. He was 88. Mr. Granado, who settled in Cuba in 1961, died of natural causes, according to Cuban state television. His ashes were to be scattered in Argentina, Cuba and Venezuela, a state newscast said. Mr. Granado was born in the Argentine town of Hernando on Aug. 8, 1922. One of three sons of a Spanish émigré and railroad clerk, he studied biochemistry and pharmacology at the University of Córdoba. It was in that city that he met Ernesto Guevara, an asthmatic teenager who was determined to play rugby with Mr. Granado’s team. They became close friends, sharing an intellectual curiosity, a mischievous sense of humor and a restive desire to explore theircontinent. Protesting high taxes and wanting to limit government power is the equivalent of a Communist revolution? Sounds more like the Tea Party movement. After making that bizarre comparison, Phillips further explained the plot of the new film: "This Robin joins the fight to get the English king to sign the Magna Carta in the year 1215, the document establishing the first rights on which modern democracies are based." Guevara, of course, was the ruthless henchman of Cuban dictator Fidel Castro, hardly an advocate for democracy. Yoani Sánchez, the blogger who has gained an international following detailing the absurdities of daily life in Cuba, is on the phone from her 14th-floor apartment in Havana, where the elevators rarely work. She speaks plainly, boldly, with none of the hemming and hawing common among folks on the island who fear their phones are tapped. Sánchez is certain hers is. She is constantly followed, too. None of this stops her from finding ways, despite government attempts to block her, of continuing to post to Generación Y, the blog she launched in April 2007 and for which she has won several awards. Time magazine named her one of the 100 most influential people in the world in 2008.